Cramps are painful, involuntary contraction of muscles. Runners experience muscle cramps most commonly in the calf (gastrocnemius and soleus muscle). Cramping can occur either during a run or after it, with some experiencing cramps hours after a run. Sometimes the cramping can occur at night while sleeping, bringing about an involuntary contraction of the calf muscle and causing intense pain, and may even cause the ankle to flex. Cramps cause the muscle to spasm, inhibiting the flow of blood to the muscle. Decreased blood flow also makes it difficult for oxygen and nutrients to be delivered to the muscle. 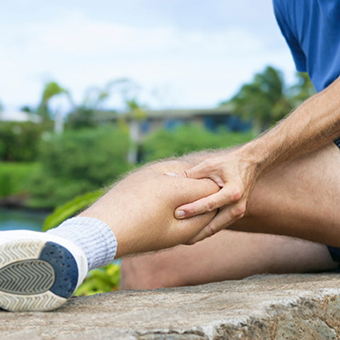 There are several ways to prevent and treat muscle cramps in the calf muscles. Hydration: Make sure you properly hydrate before, during and after your workout. Make sure you have hydration product with you on your run – from Nathan and Amphipod – so you are able to drink when you need it and are not waiting to reach the next water fountain. Electrolyte Replacement: Electrolytes aid in muscle contraction and are lost through sweat – which contains water and vital minerals such as sodium, magnesium and potassium – during the course of a workout. These minerals have to be replenished just as much as you need to hydrate during the course of your run. A great sports beverage like Nuun is a great to both hydrate and replace electrolytes. Other nutrition products such as gels and chews also contain electrolytes as do Salt Stick Capsules. Compression: Using a compression sock or sleeve from CEP can reduce muscle vibration and increases blood flow to the muscles to limit cramping of the calf muscles. Arch Support and Foot Alignment: An improperly supported arch or poorly aligned foot can make the muscles of the calf work harder and increase fatigue. A Superfeet insole can properly support the arch and align the body so it works more efficiently. Stretching: Gentle stretching of the calf muscle at the onset of a cramp can limit the pain. The calf muscles may remain tight even after the cramp subsides and should be stretched. Massage: Massage when a cramp strikes will help to increase blood flow and inhibit the spasm. After the workout use such products as a Grid Roller from Triggerpoint or a Massage Stick from Addaday to massage the muscles and increase blood flow.